There is a place where the sidewalk ends, along with my Spring 30 for 30, and this is it (see where the sidewalk literally ends?). It's been a fun month of outfits, but I am excited to wear some different clothes. And, although there were a few items of clothing I chose to include in my 30 selected items that I only wore one or two times, overall, my items served me well for this season's 30 for 30. Until the next 30 for 30, stay tuned for my Summer Shopping Wish List, more delicious recipes, Friday Favorites, posts about tackling the rest of my 30 for 2012 list, and even some new outfits. Also, a huge thanks to all of you for helping me stay motivated to write Messy Jess C. I hope you continue to enjoy this blog. If any of you have suggestions for posts and topics you would like to read about in the future, please leave a comment below or email me. Thanks again for helping make Messy Jess C. a success! Congrats on finishing another 30 for 30 and YAY for wearing new clothes! Thanks Sharon! So excited to update my summer wardrobe. Hope you are having a great week! Stunning outfit! I love the red blouse with the purple heels! You do a great job combining great colors into your wardrobe. 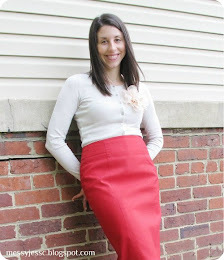 Also that JCrew pencil skirt is so nice! Thanks Cassidy! I love how colors make things fun and can still look professional when combined in the right ways. Hope you are having a great week!